ROOTING AROUND: OUR FARM BLOG: Outstanding in the Field Comes to Farm Fresh To You! Outstanding in the Field Comes to Farm Fresh To You! 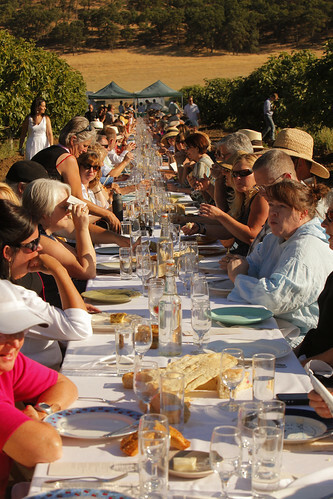 Earlier this year, we posted on our blog how excited we were to be chosen to take part in a "roving culinary adventure," as the acclaimed Outstanding in the Field (OITF) chose us for one of their amazing events. 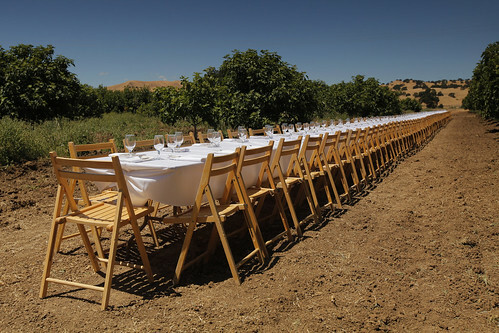 I had not fully realized the true, indescribable force of this traveling, fine dining experience taking place in the fields of farms across the United States. 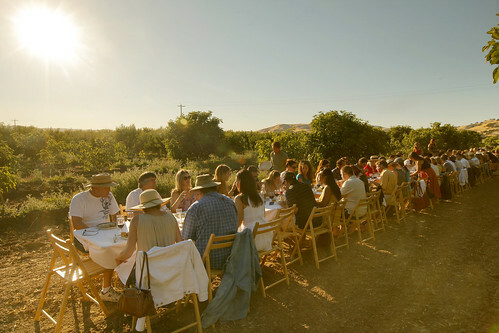 It was not until the trucks, trailers filled with tables and chairs and OITF staff appeared on our Farm Fresh To You farm that I got the actual pun – Outstanding in the Field and the dinner happens to be an outstanding meal while standing in a field. It was a bit of a mystery where the dinner was actually going to be held. 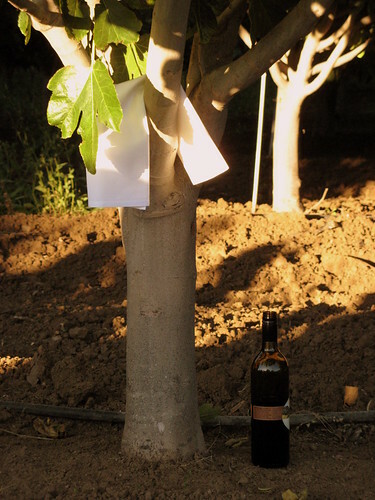 We suspected that they would organize their long row of tables near the fig orchard on a bench of soil that overlooks both lower fields of the farm, however, the spot they picked was where the Mission figs met the Candystripe figs, a long and straight patch that is a dirt road in the summer and early in the fall gets a ditch pulled through it to facilitate the rainwater that runs off the hills, through the farm and into the creek. It was a beautiful evening for June, the high temperature for the day was in the low 80’s, which was splendid considering the late June potential for one-hundred-degree-plus days. 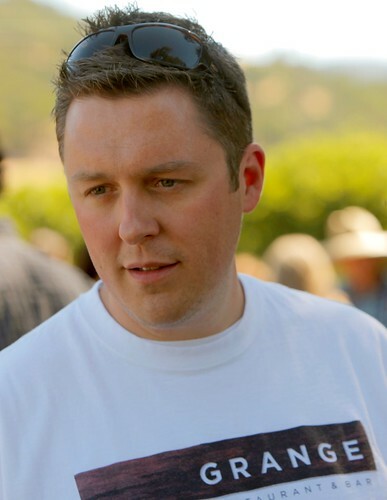 The event kicked off with a reception in the shade of our oak trees and passed hors d'oeuvres. 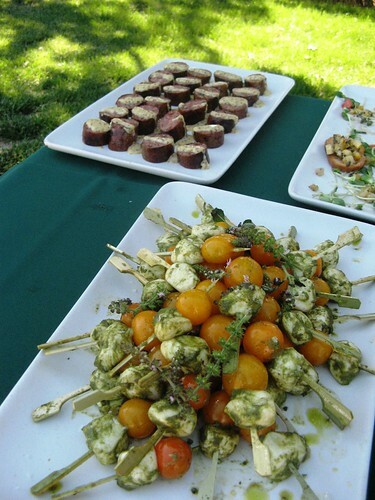 We enjoyed cherry tomato bocconcini, artisan sausages and summer squash puttanesca crostinis. Berryessa Gap Wines offered their refreshing 2011 Verdelho that paired nicely with the food and weather. 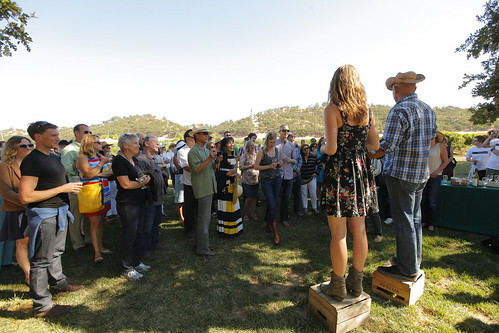 Jim and Leah from OITF welcomed the guests and told us a little about their first dinner, and how they are now taking their dinners to farms across the nation. Freeman and I both gave quick tours of the farm. 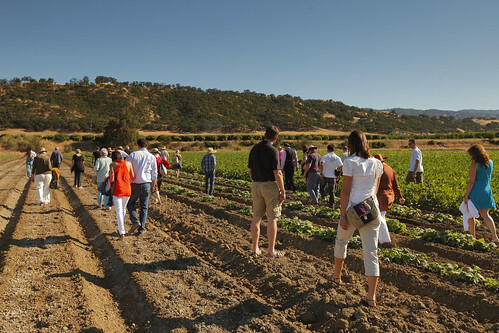 We showed guests the summer squash fields, fig and citrus orchards, irrigation canal and strawberry fields. Chef Oliver Ridgway from Grange Restaurant in Sacramento did a splendid job of incorporating into the menu our summer squash from the field by the office, the first cherry tomatoes from the field by the creek and figs from the orchard that we were being shaded by. 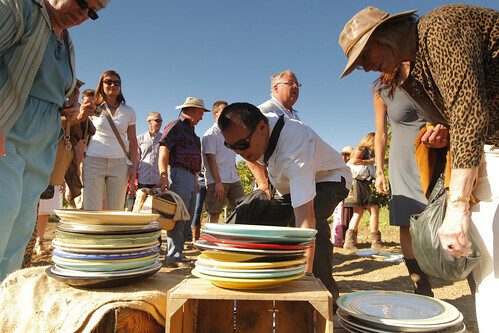 In a tradition that continues since OITF first started, people bring their own plates, showing a myriad of colors and styles - each contributing to the unique table composition. Once seated, the first dish presented was a beautiful California Farmers Salad with our fruits and vegetables, mezzo secco and raspberry balsamic dressing. The salad was paired with a 2009 Berryessa Gap Malbec. 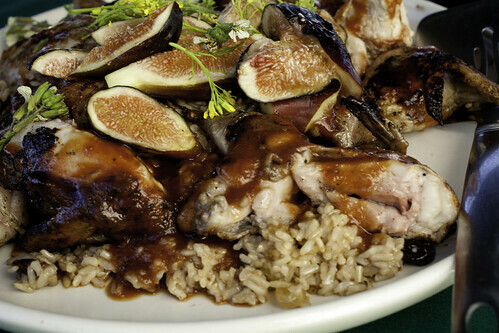 The next course was a delectable quail from Wolfe Ranch with a wild rice pilaf from Lundberg Family Farms, preserved fruit and a Bing cherry glaze. The wine served with this course was from the 2007 Berryessa Gap Rocky Ridge Collection Tradition, which is is a mix of Petite Sirah and Zinfandel. 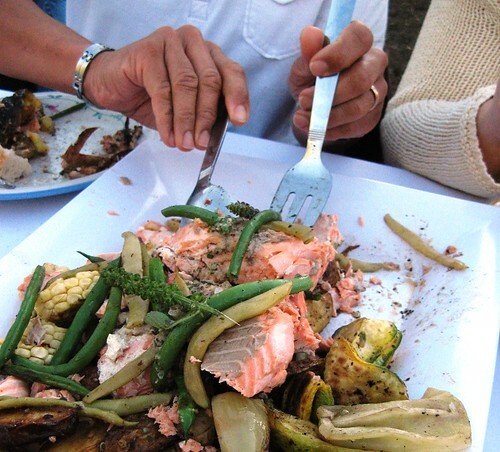 Next came the California King Salmon with our summer squash, Full Belly potatoes and a flowering herb butter. This succulent dish was paired perfectly with a 2009 Berryessa Gap Zinfandel. And last, but definitely not least, was dessert: a summer fruit composition with sweet and salty choux buns. While sitting there, I admired our Candystripe fig orchard that was full and budding with fruit that will harvest in August. They did pick a nice spot to set up the tables. 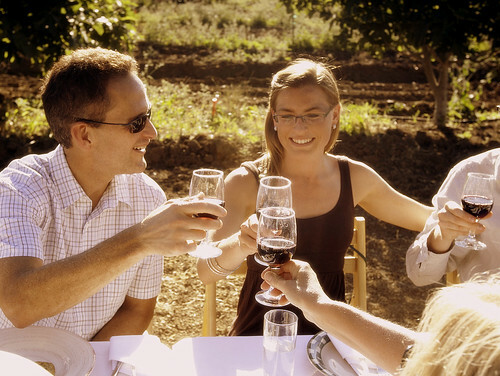 To the left and right were guests and the end of the tables was met by background of rolling golden hills speckled with olive green oak trees. 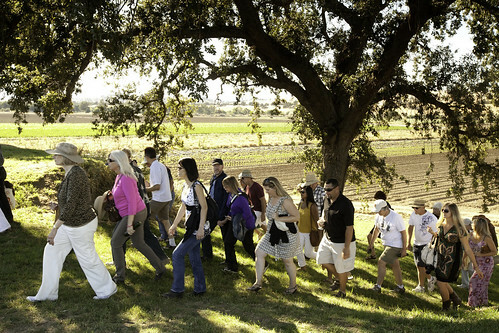 It was a magical night in a field in Capay, and we could not feel more honored to take part. Coming Back & Catching Capay Tomato!